Everything You Need to Succeed in Business…in an Instant. …and 50 other fantastic ideas, tips and tricks that will give you the confidence, answers, and inspiration you need to succeed. John Adair is the business guru who invented Action Centred Leadership now one of the most widely used leadership models in the world. Organizations worldwide use it to develop their leadership capability and management skills. PART ONE: GETTING YOUR ACT TOGETHER. Fifteen Greatest Ideas for Finding the Work You Love. Idea 1: Finding your role. Idea 3: Three useful indicators. Idea 4: How to find the right road. Idea 7: Success is result, not goal. Idea 9: Setting aims and objectives. Idea 11: A forward-looking attitude. Idea 13: Successes and failures. Idea 14: A shortcut to personal success. Idea 15: Don’t expect an easy ride. Seven Greatest Ideas for Getting on with People. Idea 17: Make others partners with you. Idea 18 Remember to say thank-you. Idea 19: Use yourself as a gauge. Idea 20: Share what you know. Idea 21: Be trustworthy in word. Idea 22: Show that you trust people. Eight Greatest Ideas for Success Qualities. Idea 26: Generosity of spirit. PART TWO: USING YOUR TIME TO GOOD EFFECT. Six Greatest Ideas for Developing a Personal Sense of Time. Idea 31: Time used will is life. Idea 32: Setting your course. Idea 33: A sense of purpose. Idea 34: Sell to yourself on benefits. Idea 35: Making time to think. Idea 36: A sense of perspective. Seven Greatest Ideas for Major Time Savers. Idea 37: Learning to say no. Idea 38: Delegate, delegate, delegate. Idea 39: Always do what you say you will. Idea 41: Don’t waste time on the past. Idea 42: Don’t make the same mistake twice. Idea 43: Cut your losses. Five Greatest Ideas for Principles and Planning. Idea 44: The skill of planning. Idea 45: The worst-case scenario. Idea 46: The planning/implementation ratio. Idea 48: Time for reflective thinking. Six Greatest Ideas for Effective Daily Work. Idea 49: Plan your day. Idea 50: Prioritize – no, really prioritize. Idea 51: The Pareto principle. Idea 52: How to control interruptions. Idea 53: Deal with your paperwork. Idea 54: Make use of committed time. PART THREE: Develop Your Leadership Skills. Four Greatest Ideas on Career Management. Idea 55: From specialist to business leader. Idea 56: Checklist: Are you a born leader yet? Idea 57: Can leadership be developed? Idea 58: Awareness, understanding, and skill. Five Greatest Ideas for Understanding Groups and Organizations. Idea 59: Group personality and group needs. Idea 60: Task, team and individual. Idea 61: Three sets of needs. Idea 62: Theinteraction of the three circles. Idea 63: Checklist: The Three Circles. Ten Greatest Ideas for Effective Leadership. Idea 64: The generic role of leader. Idea 65: Eight leadership functions. Idea 67: The 50:50 rule for motivation. Idea 68: The Adair short course on leadership. Idea 69: The hallmarks of an excellent team. Idea 71: What leaders need to know. Idea 72: Levels of leadership. Idea 73: Successful chief executives. PART FOUR: Sharpen Up Your Communication Skills. Seven Greatest Ideas for Better Communication. Idea 74: The Communication Star model. Idea 75: How to use the Communication Star. Idea 77: Six rules for effective public speaking. Idea 78: The art of listening. Idea 79: Accentuate the positives. Idea 80: Make best use of feedback. Six Greatest Ideas for Productive Meetings. Idea 81: Five types of meeting. Idea 84: Six golden rules for chairmen. Idea 85 Always follow up with action points. PART FIVE: EFFECTIVE THINKING SKILLS. Fifteen Greatest Ideas for Effective Thinking Skills. Idea 86: Know your mind. Idea 90: Checklist: How imaginative are you? Idea 92: Your depth mind at work. Idea 94: It does get easier. Idea 95: Evaluating your options. Idea 96: How to be more creative. Idea 97: The Nine-Dots test. Idea 98: Checklist: Are you thinking creatively? 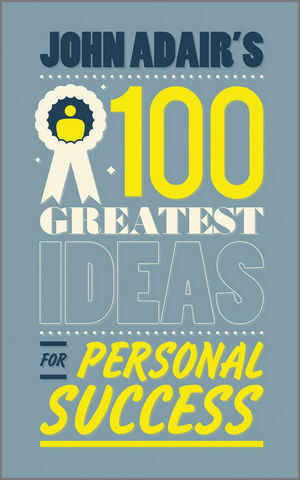 Idea 100: Developing your thinking skills. The 25 Attributes of Top Leaders and Managers. Solution to the Nine Dots Test.